NCAWA provides scholarships to deserving female students attending the state’s law schools. This award has been named in honor of retired Chief Justice Sarah Parker of the Supreme Court of North Carolina. 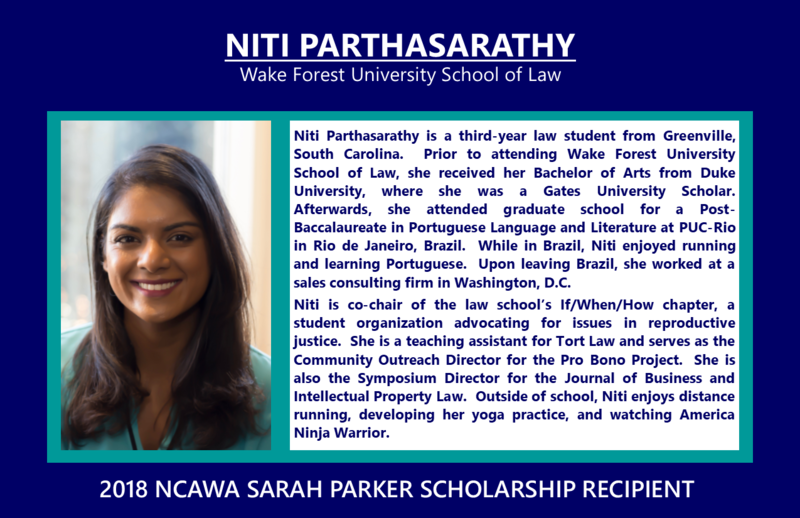 In past years, the North Carolina Association of Women Attorneys (NCAWA) offered the Sarah Parker Scholarship Awards to a deserving female student at each law school in North Carolina. 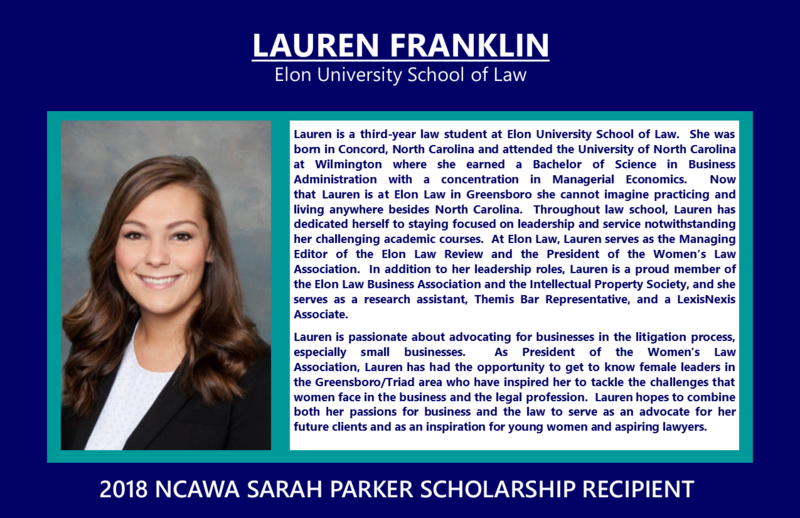 Beginning academic year 2018-2019, NCAWA will offer two (2) Sarah Parker Scholarship Awards, each in the amount of $2,000, to two female students from North Carolina’s law schools. Scholarship recipients are leaders and/or active in their law schools and communities. They are aware of the obstacles women attorneys face and display a willingness to meet and challenge those obstacles. Scholarship recipients are students who best exemplify, in their approach to the study and future practice of law, the incorporation of NCAWA’s goals of assuring the effective participation of women in the justice system and in public office, promoting the rights of women under the law and promoting and improving the administration of justice. Prospective scholarship recipients must be law school students who are continuing their education through the fall of 2018 and cannot be graduating third year law students. All scholarship applications, with accompanying résumés, must be emailed to the NCAWA scholarship selection committee at [email protected]. Applications and résumés should be submitted in PDF format. Applications and résumés must be provided to NCAWA no later than April 23, 2018. Students can submit documents directly to NCAWA or law school administrators may gather all applications and submit to NCAWA by April 23. The two scholarship winners will be notified, along with their law schools, in early May 2018. Scholarship recipients will be recognized at the NCAWA Annual Conference, which will take place on September 27-29, 2018 at the Sheraton Charlotte Hotel. Additionally, they will be highlighted on the NCAWA website, invited to participate in NCAWA’s Government Action Committee activities and legislative update conference calls, and encouraged to attend local Chapter networking and educational events. Please join us in celebrating and congratulating the 2018 NCAWA Sarah Parker Scholarship winners!